Dynamo lighting: who hates it? Almost everyone. 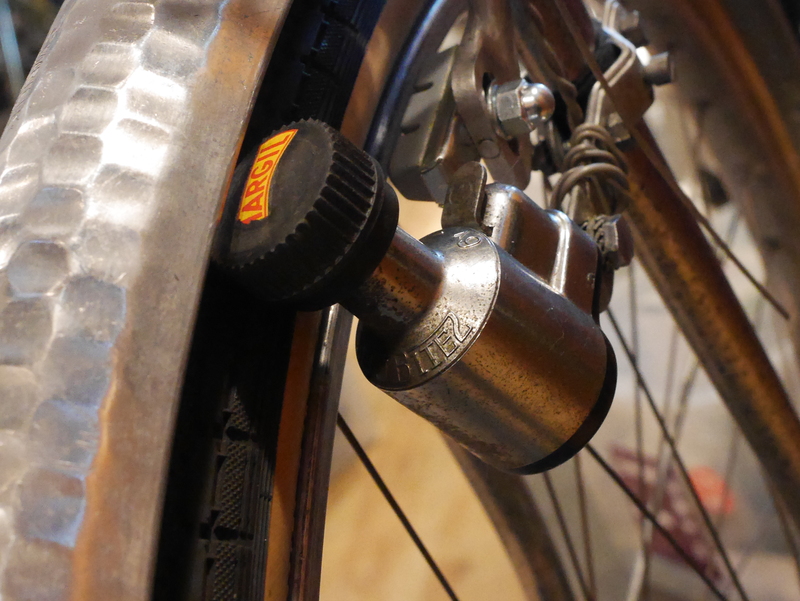 But virtually all vintage bicycles, except those wondrous vintage Raleighs with Sturmey Archer’s dynohubs, use sidewall or bottom bracket-driven dynamo lighting. Today, I was finally connecting the wiring on the Mercier Meca Dural’s lighting system – a project I have been putting off because, well, I hate dynamo lighting. The bike’s own original fork-mounted dynamo had long ago been lost, so I set up this nice Soubitez unit, shown above, which is very light-weight and free-spinning, as compared to its slightly older counterparts, shown below. Lighting set-up is a project that I would rate right along side fender line adjustment and front rack mounting: patience and resolve can be sourly tested as one works through the glitches and conundrums involving wiring routing, bulb wattage, voltage mysteries, and the absolute worst: cutting electrical wires and clearing their housing so that they can be spliced properly to carry the current through the system. There are very few resources which adequately discuss how to set up a sidewall driven (or bottom bracket driven) lighting system. For the uninitiated, setting up the wiring on these old systems can seem daunting. The most important aspect of the set up is insuring that the dynamo is positioned correctly so that a straight line can be drawn through the center of the dynamo, down to the center of the wheel’s drop out. This will insure that maximum efficiency is obtained from these already inefficient devices. Another mystery can be the wiring set up. Every dynamo needs a ground. 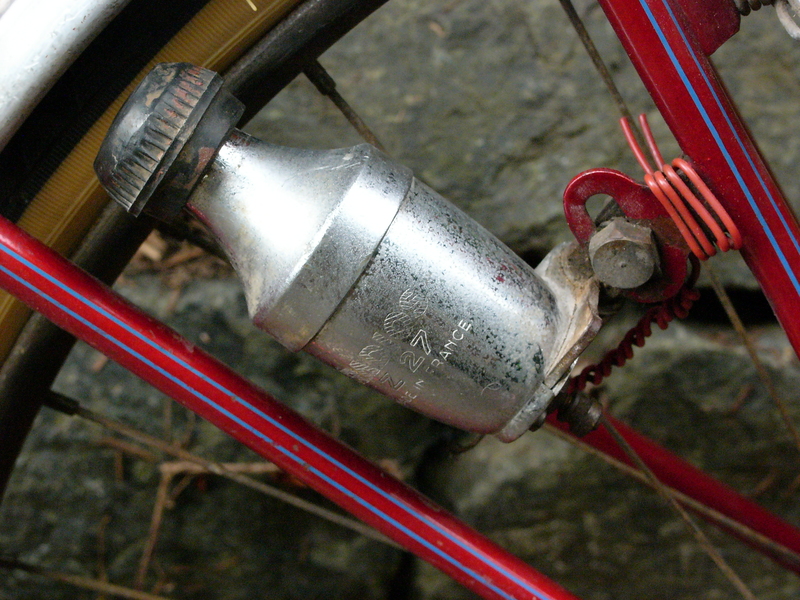 For vintage steel bicycles, the ground often existed automatically via the presence of a “ground screw” which contacted the steel frame. The above illustrations are courtesy of Glenn’s New Complete Bicycle Manual. They show how to set up the wiring, and how to position the dynamo. Fortunately, the wiring part of these old systems is very simple: hook one wire to the front bulb, one to the rear, and both into the dynamo. These old systems are 6 volt/3 watt power that can easily be upgraded to LED lighting. One can apparently blow out the lights if going at very high speeds. I haven’t had that experience yet, though. 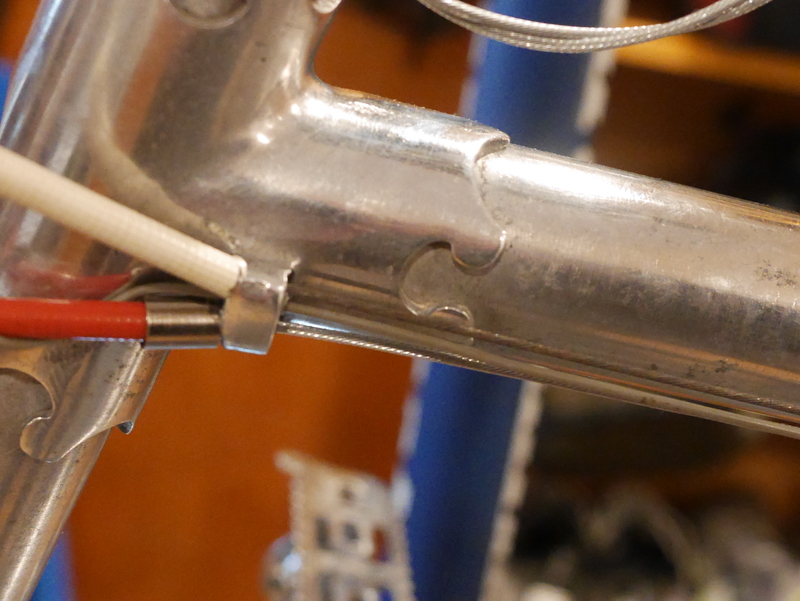 3 wires through the lug braze-on: shifter cable, brake cable, and dynamo wire. 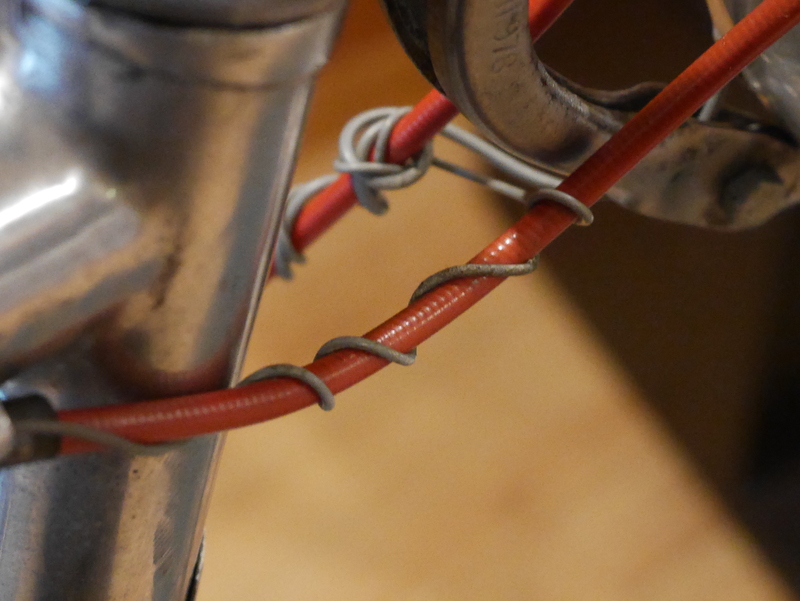 Routing the dynamo wires across the bicycle’s frame can lead to frustration. If you are really obsessive, you can make the whole thing look magnificent (clearly, I am NOT in this camp). Ideally, you wrap the lighting wires wherever they can be wrapped, in this case around the brake housing. 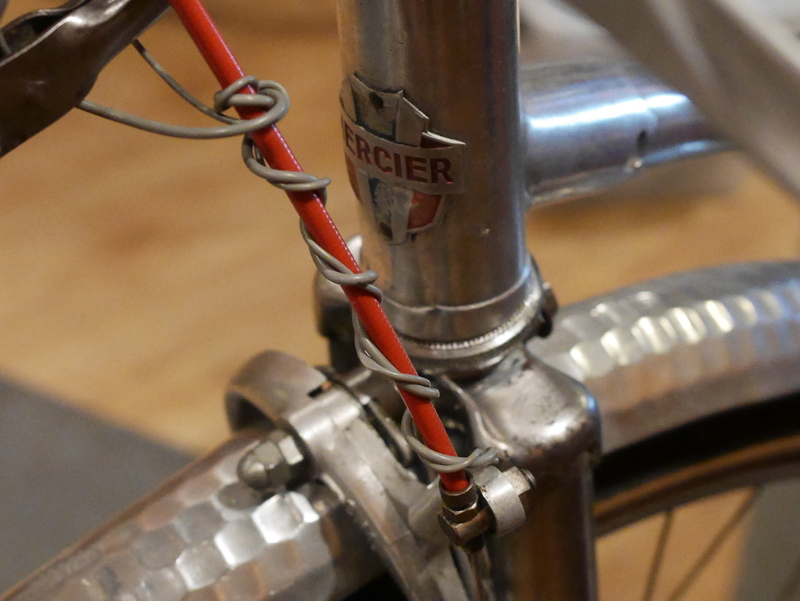 This Mercier Meca Dural has wonderful lugs which include many options for cable routing, so I ran them through one of the openings, and brought the wiring up across its sloping top-tube, to the front fork where the dynamo resides. 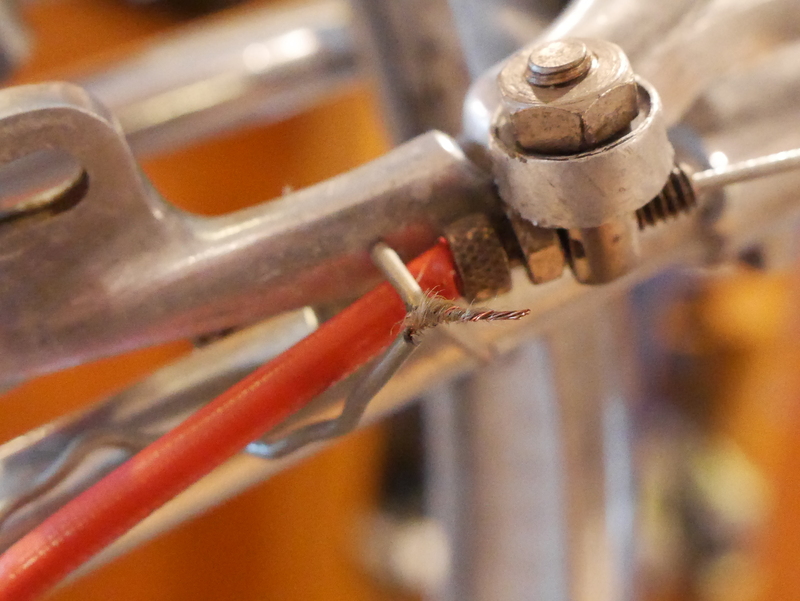 In between, I wrapped the wires around the front and rear brake cables. Amazingly, after changing out the wiring with something new and replacing a burned out front bulb in the Luxor 65 headlamp, the system worked! Testing this out on the road will be fun, as this dynamo’s drag is significantly less than other’s I have tested. If you really are interested in dynamo lighting for your own bike, you could consider using the more efficient Dymotec 6 from Busch & Muller. I’ve had one of these around in my shop, but haven’t tried it out yet. It is definitely lighter than any vintage dynamo I have handled. However, I will also say that Soubitez dynamos appear to have the least drag among all the vintage dynamos I have tested. 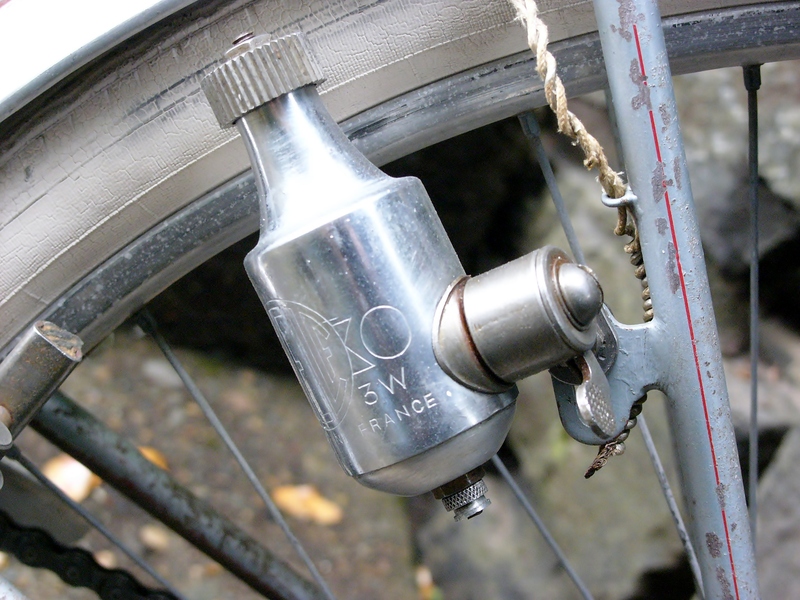 I have two of these – each mounted on my Jack Taylor bicycles – a 1973 Touring model, and and 1976 tandem. They still work very well after all these years. I do love the engineering quality of these old steel dynamos. They are very pretty, but very heavy. And, while I still hate dynamos, there are lots of reasons to love them. They can be disengaged whenever you want, so are only creating drag when lighting is needed. 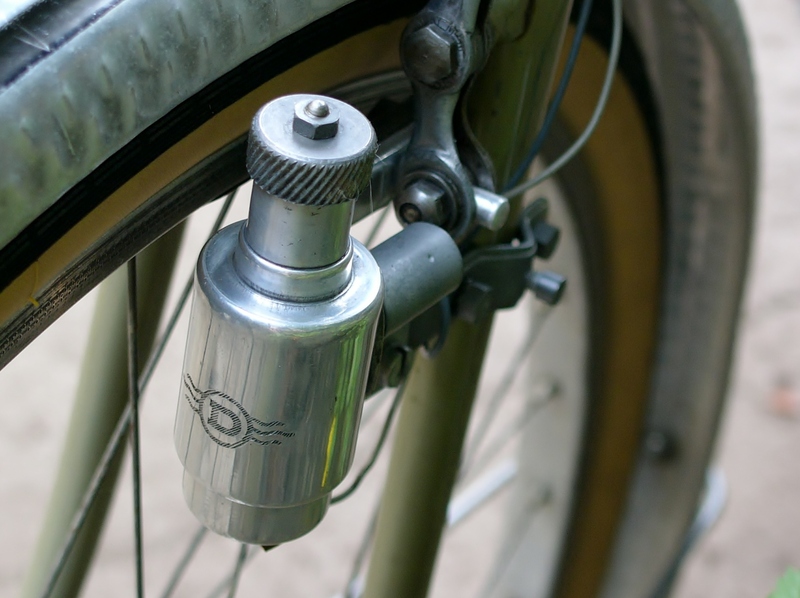 They aren’t that much heavier than a hub dynamo, and are simple to add or subtract to an existing bicycle, without the complexity of a hub dynamo. 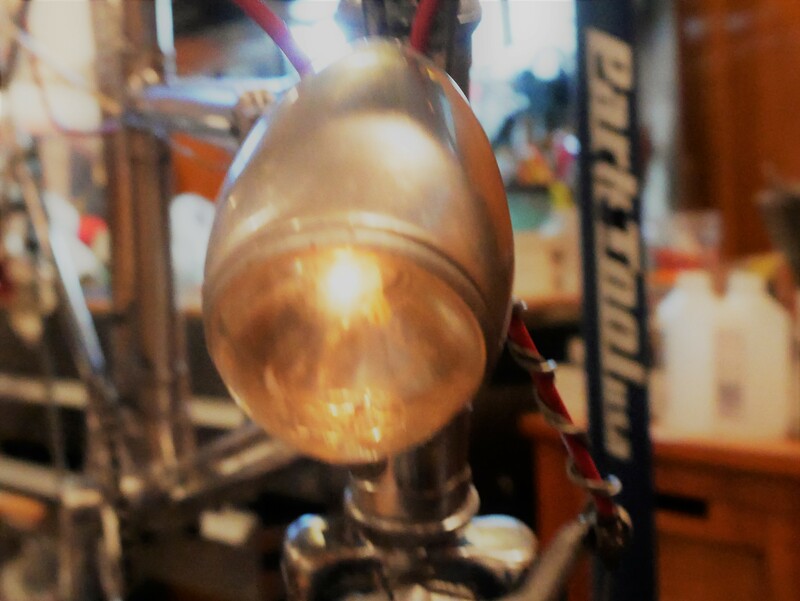 So, if you like riding vintage bicycles, maybe you will like dynamo lighting. 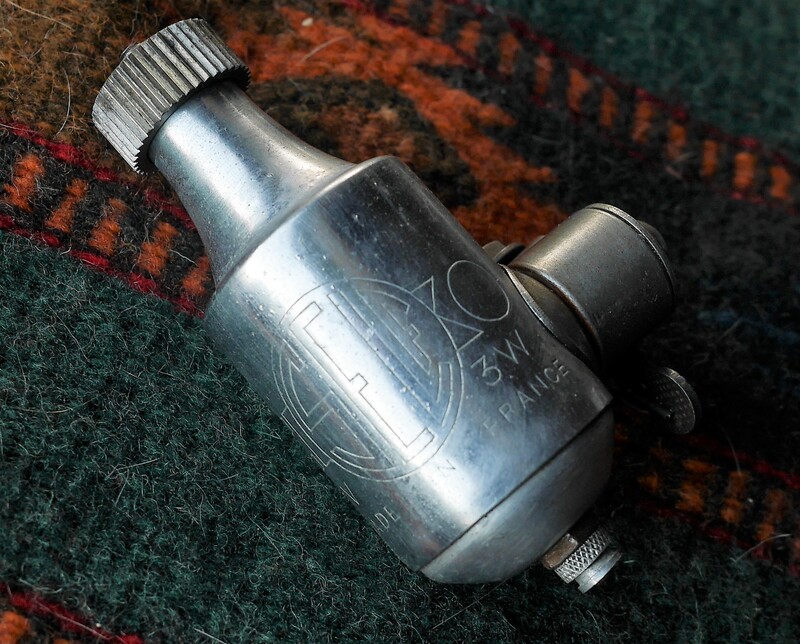 This entry was posted in Bicycle restoration, Mercier, Vintage bicycle restoration, Vintage French Bicycle and tagged bottle dynamo, dynamo, Jack Taylor, Mercier Meca Dural, Soubitez by Nola Wilken. Bookmark the permalink. I do like the look of old bottle dynamos, maybe not the performance. I do have a modern AXA HR, which is a GREAT bottle dynamo! It uses a rubber roller that’s replaceable (less drag/noise/sidewall wear). I have it on my Crested Butte, so I use one of those funky brackets that mount to the brake boss. That way it stays in place. I wish they made the AXA HR readily available in this country, as it is inexpensive and good. Best one you can find here is that B+M unit. I’ve also heard the Nordlichts are great, and have a metal body so will look more appropriate on a vintage steed. Thanks, Shawn – good recommendations for other bottle dynamos. The one thing I will say, on a positive note, is that it’s nice to be able to turn them off when not needed. To be honest I never hated my bottle generator in fact I loved them! I installed my first generator light set in June 1971 and it sure made a big difference. It was a cheap set made by Royce Union. The light was brighter and a lot more reliable than the battery light set that needed two “D” size batteries. In the winter months it helped me on every Friday evening while I was near the end of my money collection from my paper route’s costumers. The sun would set around 4:40 to 5:00 pm and it was a great help to have lights so the drivers and pedestrians could see me. And as I got older I went off on many rides into the night with no fear of batteries dying. I never worried about the extra drag when the lights were on because it was so nice to have a set of bright front and rear lights. I could never understand why any cyclist would not ride with one. Even today with the newer dynohubs I can not understand why many cyclist continue to ride with no lights at all, even with the great battery light systems that are available today! I agree that riding without lights at dusk or in the dark is really dumb. However, many cyclists with their powerful hub dynamos don’t realize that the front light is meant to illuminate the road ahead, and not to blind other cyclists and motorists. I have been blinded on many occasions-it’s very unsafe for cyclists not to position the front headlight correctly. 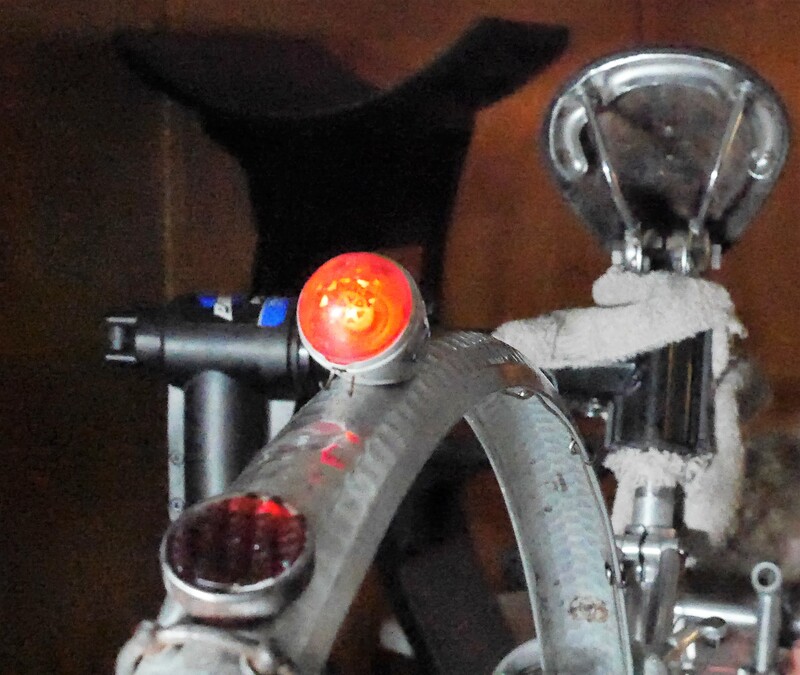 I have not ridden with a generator light, but plan on including one on an upcoming project. Is there a reason that you chose a front wheel mount, rather than rear wheel or bottom bracket mount(s)? The system needs a steel ground, so for this bike with it’s aluminum frame, the steel fork is the place to mount the dynamo.